New Zealand and its major cities, such as Auckland and Wellington, frequently rank near the top of global surveys regarding quality of life, happiness, and health and well-being. It also has one of the largest cooperative sectors of any developed country. Are these things related? I spent much of the last two months conducting research in New Zealand, where cooperatively-owned businesses are everywhere. Turn on the television, you’ll likely see an advertisement by the cooperative Fonterra talking about how it is farmer-owned. Fonterra is the largest company of any kind in the country as well as its largest exporter. If, on any given day, you observed proceedings and legislative debates in New Zealand’s Parliament, as I did, you’d likely hear references to one or more of the country’s major cooperatives: beyond Fonterra, a number of other iconic NZ industries, such as lamb meat, wool, and kiwi fruit, are led by or include significant cooperative enterprises. Outside of quintessential Kiwi export industries, however, are many other local-serving business sectors led by cooperatives. The NZ unit of the global flower delivery company Interflora, known as FTD in the US, is a co-operative. In fact, this is the only region of the world for which the Interflora/FTD network is structured as a co-operative. Elsewhere, Interflora is an investor-owned corporation. But in New Zealand, it is owned by the local florist shops around the country. Like Interflora, many of NZ’s largest cooperatives are producer cooperatives, basically a federation of smaller businesses which band together to create a network, and achieve scale. Beyond Interflora, the #1 grocer is a producer cooperative, Foodstuffs. The leading private health insurance company? Southern Cross, a mutually-owned society, a type of cooperative. The top taxi companies in the three major cities of Auckland, Wellington, and Christchurch in New Zealand? Cooperatives. The Home Depot of New Zealand? Called Mitre 10, it is also a co-operative. 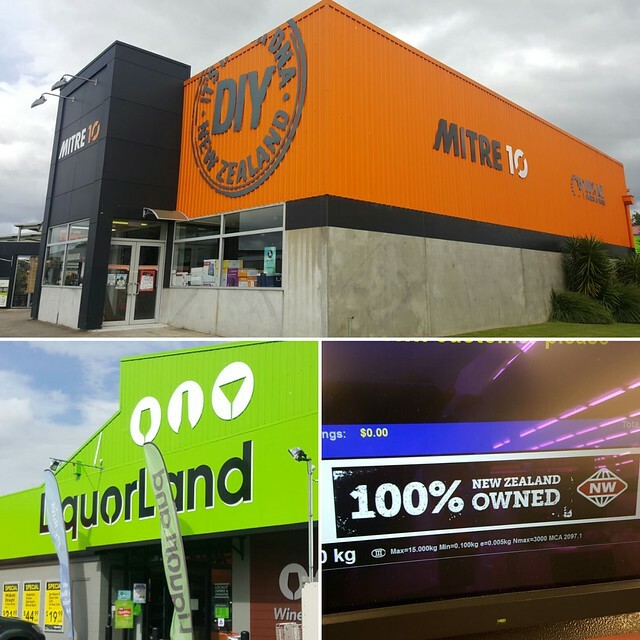 Among NZ’s cooperative ventures actively touting their New Zealand ownership are New World and Liquor land, both divisions of Foodstuffs, and Mitre 10. Photos here all taken from the premises of major New Zealand co-ops. And that branding is a big clue as to the chief reason why the cooperative model is so widely used here in New Zealand: it’s about local control and ownership. There is a deep history in New Zealand of having to band together to both meet basic needs, and to find a way to compete on a global stage, too. This is partly because Kiwis had to band together, first in order to survive, and then to compete with businesses abroad. Why? New Zealand is a fairly small country that is far away from the rest of the world. Its size and distance to global markets creates, in the language of economics, transaction and opportunity costs. These costs result in barriers to entry that cause markets to behave imperfectly or to outright fail. What does that mean in plain English? It means that if I’m a big global company who wants to expand into a new market, unless I’m from Australia, the last place I’m probably going to expand to is New Zealand. Why? First, it’s small: it doesn’t quite have 5 million people, about the same size as the Republic of Ireland or the State of Minnesota. But unlike those two places, it’s remote. It’s thousands of miles away from all other states or countries. The shortest direct flight from the US is roughly 13 hours. Even to get to Australia, the closest major country, is nearly a 3-hour plane ride. This distance means it’s expensive to ship things or travel here. And once here, remoteness is an issue due to physical geography: mountain ranges and rivers on the two main islands make much of the population hard to reach. Beyond the three major cities, which together account for over half the population, the remaining population is spread across far-flung areas connected by ferries, mountain passes, and planes, not highways running across flat plains. Thus, even if you wanted to expand to New Zealand, you’d face additional costs in trying to service it, nation-wide, given its spread and terrain. The end result? If New Zealand wants its economy to have certain kinds of businesses, it can’t rely on market forces to entice business from other countries to service or finance its needs. It has to provide them itself, and it has to get creative to do it. New Zealand short-hand for this mindset is “the number 8 wire”, which refers to a type of wire used in sheep fencing, long creatively deployed here to fix all kinds of household problems. But, beyond getting creative in their use of co-ops out of need, New Zealanders may also not want to be beholden to other countries to provide it with products. It may want to control and own those businesses, and hold on to the profits of those businesses, too. In recent decades, as Australians, the closest major economy, have sometimes acquired or built foreign-owned businesses in key industries, this has been a concern, buoying support for co-operatives, which have done fairly well in advocating for themselves here in New Zealand. They have successfully lobbied to pass laws, for example, which allow them to readily raise some capital by using the public stock market (while still maintaining majority control and ownership in the cooperative). This is not allowed in the US. The cooperative is not the only approach to local business ownership and control in New Zealand that, to an American, might seem “a little different”. While its banking and electricity systems include cooperatives, they also include other cooperative-like ownership structures. Consumer trusts and community trusts are legal entities in NZ where a business is held in trust for community beneficiaries. In Auckland, for example, most households get a customer dividend rebate, because the main electricity utility is majority-owned by a consumer trust. This same entity (Entrust), has begun installing Tesla-powered community solar projects in the region. Similarly, TSB, the seventh-largest bank in the country, is owned via a community trust. Through this ownership structure, its millions in profits each year are entirely distributed to local charities and non-profits rather than paid out as dividends to shareholders. Recipients of these funds go through a competitive application process. Can you imagine what your world might be like, if the profits from the major banks, utilities and grocers where you live flowed directly back to your community, through co-operatives and similar ownership structures? Perhaps there is, indeed, a connection between those quality-of-life outcomes and New Zealand’s status as a cooperative commonwealth. After all, cooperatives keep the profits in the country, for reinvestment back into the local communities which produced them. Post and photos by Jason Spicer. Jason is a PhD Candidate in the Department of Urban Studies and Planning at MIT, currently completing research for a dissertation on the challenges that cooperatively-owned businesses in the US and other developed democracies face as they try to grow. This is the fourth post in a series on his research.